The Council area included the city of Armagh, as well as the surrounding area. City status was officially conferred in 1995. Armagh has a long reputation as an administrative centre and the headquarters of the Southern Education and Library Board and the Southern Health and Social Services Board are still located in the city. The Armagh Outreach Centre was established in 1995 and is linked to the Queen's University of Belfast. The heads of both the Roman Catholic Church in Ireland and the Church of Ireland reside in the city. The district consisted of four electoral areas: Armagh City, Cusher, Crossmore and The Orchard, from which 22 councillors were elected for a period of four years by proportional representation. At the last election in 2011 members were elected from the following political parties: 6 Ulster Unionist Party (UUP), 6 Sinn Féin, 5 Social Democratic and Labour Party (SDLP), 4 Democratic Unionist Party (DUP), and independent Councillor Paul Berry, a former DUP councillor. The last mayor of Armagh was Councillor Freda Donnelly (DUP). The last election was due to take place in May 2009, but, on 25 April 2008, Shaun Woodward, Secretary of State for Northern Ireland announced that the scheduled 2009 district council elections were to be postponed until the introduction of the eleven new councils in 2011. The proposed reforms were postponed in 2010, and the most recent district council elections took place in 2011. Together with part of the district of Newry and Mourne, it formed the Newry & Armagh constituency for elections to the Westminster Parliament and Northern Ireland Assembly. 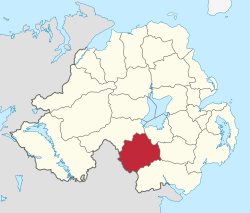 The area covered by Armagh City and District Council had a population of 59,340 residents according to the 2011 Northern Ireland census. Armagh City and District Council Facts for Kids. Kiddle Encyclopedia.